A new study finds that many baby boomers still have retirement accounts at previous employers, and it could be costing them. A recent study found that roughly half of baby boomers have left behind a 401(k) plan at least once when changing jobs, and 41.6 percent say they don’t expect to move retirement funds from their prior employer’s plan to their current one. It’s a costly choice. According to a 2014 study, if a 30-year-old changes jobs and leaves behind a retirement plan, that worker would lose $2,520 in fees on that stranded account as well as the compound interest the $2,520 would accumulate over time. Taken in total, the worker would lose nearly $7,000 on that account by the age of 65. 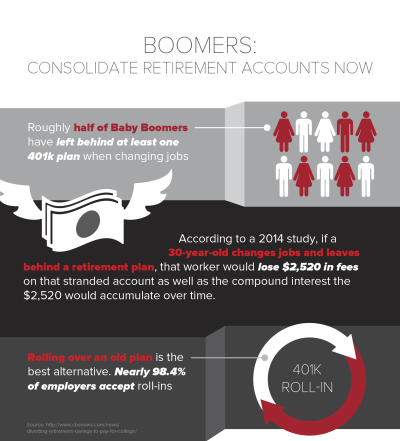 Additionally, consolidating retirement funds into fewer accounts can provide boomers with a better overview of their nest egg, allowing for more efficient and effective planning over the long run. What’s the answer then? Consolidation. Cashing out old plans can be just as costly as leaving them with the old employer, so rolling the old plan over to the new one is the better option. Fortunately, fully 98.4 percent of employer-sponsored retirement plans accept roll-ins, according to the Plan Sponsor Council of America. Managing a roll-in is rarely easy or fun, but boomers can take steps to make the process easier. Experts suggest employees check with their current HR department. Many employers offer in-house or third-party assistance with roll-ins. For boomers, a little prep work now can ensure a smoother, more secure retirement down the road. If you’re interested in learning more about baby boomers, sign up for our newsletter today.